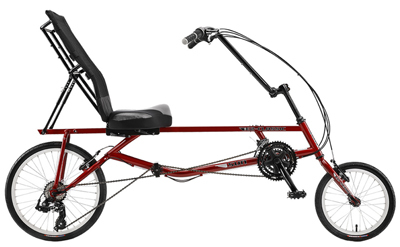 The Sun Seeker EZ-Classic is our choice for a simple, practical, low cost recumbent 2-wheeler to knock around town or the park with. How it is that you’d redesign a classic bike like the EZ-1 and then call the new version the “EZ-Classic” takes some figuring out. But the mysteries of product branding still elude us simple bicycle mechanics. Putting all that aside, the EZ-Classic is the choice for simple, no-nonsense getting around town. It is an easy to manage, highly adjustable and easy to master bike. It sits you high enough for traffic and low enough to easily start and stop. In the late 1990’s, when Easy Street Recumbents was starting, compact long-wheelbase bikes like this were sweeping the market. They fell out of favor as trikes took the scene, but there are some applications in which a 2-wheeler will always be strong, such as practical around-town riding. 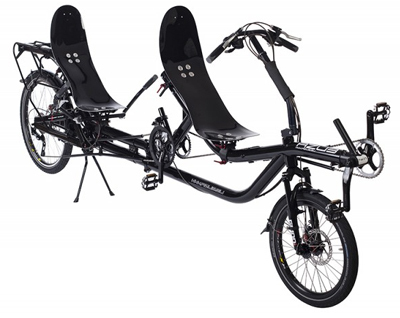 For riders too short to start on an EZ-Sport, but who want to explore recumbent bikes, this is the place to start. While Sun Seeker’s seat isn’t as lightweight as other brands’ (one piece is made of wood! ), it is quite comfortable. It features a thick, well-contoured cushion and an adjustable seat back. This gives lots of control over the position of the lumbar curve. The seat allows for a range of recline adjustment. It will sit up straight without tilting the seat base down. Sun regards this bike as a “short wheelbase” but it isn’t. 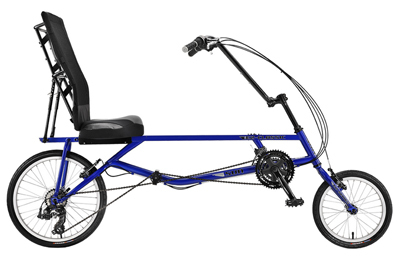 This is our one sample of a compact-long wheelbase recumbent. This model is available in blue or red. 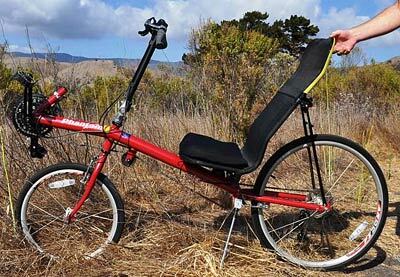 The EZ-Classic is probably the most functional of the Sun recumbents. 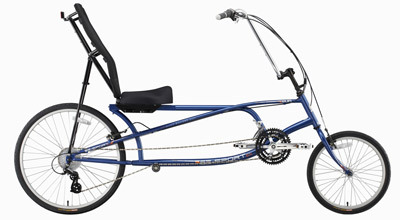 Regarded as an all around recumbent, its strength lies in its stability, comfort and predictable handling. 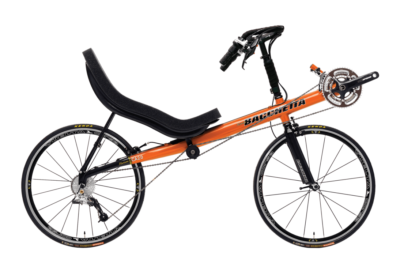 BentRider magazine, a journal dedicated to recumbent cycling, described the EZ-1 as “a nearly ideal commuter” and “an excellent path/trail bike”. 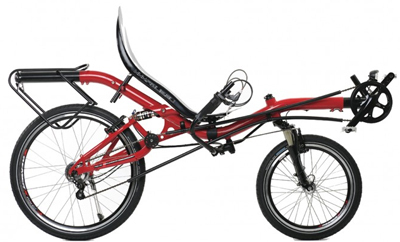 The EZ-Classic SX is the perfect entry level recumbent. With its smooth ride and comfortable, stable position, it’s designed to provide years of use. And with 24 gears to choose from, it’ll be a dream to pedal over most terrain. Seat Height 24.5″ (62cm) - This sets your eyes level with those of most motorists. Weight 39 lbs - Not lightweight, but what did you expect from our lowest priced bike? X-Seam 33″-48″ - This is a pretty huge sizing range. See our guide to ex-seam measurement here. Shifter SRAM - Basic quality gripshifter (twist shifter) from this major US component maker, designed to work with a Shimano rear derailer. Freewheel 14-28 7sp - This is an actual older-style freewheel, not a modern freehub cassette like most of our other models have. You can get a much wider range of gears by changing the rear wheel to one with a different hub. Brake Front Alloy Linear Pull - Basic quality. It'll do. Handlebar Steel w/2 Bottle Braze-ons - With the two bottle cage mounts on the seat that gives you 4 bottle cages in all. This is the bike for heavy drinkers! Stem Alloy 240mm Recumbent-2pc - Nothing you'll care about so long as your knees don't hit the handlebars. Spokes 14g. Stainless Steel - Stainless steel spokes are nothing remarkable, but they are the better quality stuff. You'll find the same spokes on bikes costing five times as much as this. Tire Front 16×1.5 BW - Basic quality Kenda Kwest tires. You can easily do better. Tire Rear 20×1.5 BW - Basic quality Kenda Kwest tires. You can easily do better.